leaking roof and decayed exterior walls. 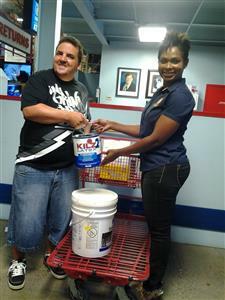 With help from AL Thompson, Rotaract Blue donated over CI$500 worth of materials to Mr Ebanks. Repairs are currently underway and the club is pleased that Mr Ebanks will soon have a happy and safe home to live in. For more information on Rotaract Blue’s home restoration programme, contact rotaractblue@gmail.com.